Mumbai, April 27, 2017: TVS Motor Company, today reported its financial results for the year 2016-17. With total sales of 29.27 Lakh units for the period, the Company’s total revenue grew by 9.6% to Rs.13363.43 crores. During the year, the Company strengthened its presence in the motorcycle and scooter segments with new launches and refreshed product portfolio. Motorcycles sales during fourth quarter of 2016-17 is 2.15 lakh units as against 2.47 lakh units registered in fourth quarter of 2015-16. Scooter sales increased from 1.98 lakh units in the fourth quarter of 2015-16 to 2.23 lakh units registered in the fourth quarter of 2016-17. The Company exported 0.98 lakh units of two-wheelers in the quarter under review as against 0.83 lakh units in the fourth quarter of 2015-16. Three wheelers registered sales of 0.15 lakh units in the quarter under review as against 0.21 lakh units in the fourth quarter of 2015-16. TVS Motor Company reported a marginal growth with total revenue going up from Rs.3090.77 crores in the fourth quarter of the financial year ended March 2016 to Rs.3139.22 crores in the fourth quarter of the year ended March 2017. The Company commenced manufacture of BS IV emission compliant products from January 2017. However, the Company based on the order of Honorable Supreme Court that only BS IV compliant product can be sold and registered from 1st April 2017, extended suitable support to the dealers to sell BS III compliant products. The profit for the quarter is net of one time provision of Rs.57 crores of discounts towards such BS III products sold by the dealers in March 2017. The Company’s Profit Before Tax (PBT) for the quarter under review is Rs.134.02 crores against Rs.156.99 crores for the corresponding quarter in 2015-16. Profit After Tax (PAT) reported for the quarter ended March 2017 is Rs.126.77 crores against Rs.136.03 for the fourth quarter of previous financial year. Total revenue for the year recorded a growth of 9.6% increased from Rs.12194.77 crores in the year ended March 2016 to Rs.13363.43 crores for the year ended March 2017. Profit Before Tax (PBT) grew by 11.1%, increased from Rs.628.94 crores in the year ended March 2016 to Rs.698.68 crores in the year ended March 2017. Profit After Tax grew by 14.1% increasing from Rs.489.28 crores in the year ended March 2016 to Rs.558.08 crores in the year ended March 2017. During the year ended March 2017, the overall two-wheeler sales of TVS Motor Company, including exports grew by 11.3% increasing from 25.68 lakh units registered in the year 2015-16 to 28.58 lakh units in the year 2016-17. Motorcycle sales during the fiscal year increased from 10.17 lakh units in the year ended March 2016 to 10.77 lakh units in the year ended March 2017. Scooter sales during the period under review increased from 8.13 lakh units in the year ended March 2016 to 8.70 lakh units in the year ended March 2017. Three wheelers registered sales of 0.69 lakh units in the year ended March 2017 as against 1.11 lakh units in the year ended March 16. The total export of the Company recorded during the year under review is 4.25 lakh units as against 4.54 lakh units recorded in March 2016. Exports of the two-wheelers and three-wheelers continue to be impacted by restricted availability of foreign exchange in the key African markets. The board of directors of the Company has declared two interim dividends of Rs. 1.25 (per share) each at their meeting held on 27th October 2016 and on 6th March 2017 respectively, for the year 2016-17. The total dividend paid for the year ended 31st March 2017 aggregated to Rs. 2.50 per share (250%) on 47,50,87,114 equity shares of Re.1/- each. The board does not recommend any further dividend for the year under consideration. 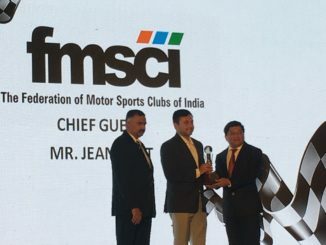 In recognition of TVS Motor Company’s unwavering commitment to quality, J.D. Power 2017 India Two-Wheeler Initial Quality (2WIQS) Study and Automotive Product Execution and Layout (2WAPEAL) study conferred top honours to TVS Star City Plus and TVS Apache RTR 160 as the best quality product in their respective segments. J.D. Power 2017 study also ranked TVS Sport as the No 1 in Automotive Product Execution and Layout (APEAL) study, in the entry segment. During the year, TVS Apache RTR 200 4V, won the prestigious Indian Motorcycle of the Year 2017 (IMOTY) award along with 14 other awards including 8 Motorcycle of the Year Awards from leading publication houses. In FY 2017-18 the Company will introduce a new motorcycle and a new scooter. In addition to these new launches, the Company has also planned upgrades across segments to strengthen its product portfolio. With the widest range of product across segments, TVS Motor Company expects to better its performance in the ongoing fiscal year and grow ahead of the industry. TVS Motor Company is a leading two and three-wheeler manufacturer, and is the flagship company of the USD 7 billion TVS Group. We believe in Championing Progress through Mobility. Rooted in our 100-year legacy of Trust, Value, Passion for Customers and Exactness, we take pride in making internationally aspirational products of the highest quality through innovative and sustainable processes. We endeavour to deliver the most superior customer experience at all our touch points across 60 countries. We are the only two-wheeler company to have received the prestigious Deming Prize. Our products lead in their respective categories in the JD Power IQS and APEAL surveys for the past three years. We have recently been ranked No.1 Company in the JD Power Customer Service Satisfaction Survey. TVS Motor Company strengthens its presence in Central America.